Rory McIlroy believes he can attack many of the holes at The Olympic Club with his driver. Photo Eoin Clarke/www.golffile.ieRory McIlroy has vowed to go on the attack at the Olympic Club and battle to become the second back-to-back US Open champion in his lifetime. The Northern Ireland ace was just six weeks old when Curtis Strange successfully defended his crown at Oak Hill in 1989. But the 23-year old still confidently expects to challenge for his second major after bouncing back to form in Memphis last week following three missed cuts on the spin. Determined to make an aggressive title defence, McIlroy said: “The last 12 months has been fantastic. I felt like I played very well in that time. And really looking forward to this week and giving it a good go in trying to defend. “I reckon I’m going to use my driver eight or nine times and I’m coming in with the mindset that I’m going to attack the golf course and play aggressively when I can. “Obviously you have to be smart, but you’ve got to take your chances around here. And this golf course gives you a few opportunities where you can make birdies. “There’s a few holes where you just have to settle for a par and be very happy with that. “But the rough is not as bad as maybe in previous years and you can get away with some tee shots. “There are holes like 18 where you just can’t go in the rough. It’s brutal. Woods knows how tough it is to win the US Open two years in a row. He won in 2000, 2002 and 2008 but finished tied 20th at Southern Hills in 2001, tied 20th at Olympia Fields in 2003 and sixth behind Lucas Glover at Bethpage Black three years ago. Woods said: “This is probably the hardest test that we play all year. What makes it difficult, I think, is that we’re playing different venues each and every year. That said, the 14-time major winner expects McIlroy to be in the mix this week after challenging for victory in the FedEx St Jude Classic on Sunday. Woods said: “I think he’s coming off a tournament last week where he played really well. I think that’s going to be great for his confidence. “He had a few weeks where he didn’t play the way that he knows he can play. But, hey, we all have those things happen. As for Woods, the title favourite is looking forward to the challenge of being forced to shape the ball both ways on a hard and fast course that features the toughest opening six-hole stretch in US Open history. “I think this probably tests the player more than any other championship,” said Woods, who won his fifth Memorial Tournament and 73rd PGA Tour title just over a week ago. “We have to shape the ball. We have to hit the ball high. We have to hit the ball low. Our short game’s got to be dialed in. McIlroy insisted he felt comfortable shaping the ball from left to right but when asked how he’d changed over the last 12 months he pointed out that winning is now the only thing that matters. “You’re not just happy with top 10’s anymore, and you’re not happy finishing in the top five,” McIlroy said. “Okay, it’s a good result, but it’s not what you want. “Maybe a couple of years ago it would be a step in the right direction and everything is good. You’re knocking on the door. Rory McIlroy would love to do this at The Olympic Cub in San Francisco in June. The course will be firm and fast but should we write him off? Picture Fran Caffrey/www.golffile.ieAlmost everyone expects Rory McIlroy to come out with all guns blazing in search of the world No 1 ranking at Quail Hollow this week. The new “old” No 1 Luke Donald is one. Rory McIlroy is another. As for Padraig Harrington, he just expects McIlroy to play well, with the occasional blip, for the next 25 years. But what can we expect from McIlroy when the US Open is played at a firm and fast Olympic Club in San Francisco in June? Rory McIlroy hits balls on the range at the Olympic Club on Monday. Picture Eoin Clarke/www.golffile.ieRory McIlroy shrugged off the final hole flop that cost him the FedEx St Jude Classic in Memphis and arrived at the US Open insisting he has high hopes of defending his title. Rory McIlroy plays his second shot into the 18th at The Olympic Club (Photo Eoin Clarke/www.golffile.ie)Rory McIlroy got a B minus for his ceremonial pitch ahead of the baseball clash of the San Francisco Giants and the Houston Astros on Tuesday might. But whether he strikes out or hits a home run when he steps up to the plate in the US Open over the next few days will depend on one thing - his patience. The 23-year old has proved to have a short fuse this year, famously hurling a club during the BMW PGA at Wentworth in the middle of a streak that saw him miss three cuts on the spin. The world No 2 got his game back on track in Memphis last week but he knows he must not let the red mist descend like a San Francisco fog if he is to become the first man to retain the US Open for 23 years. 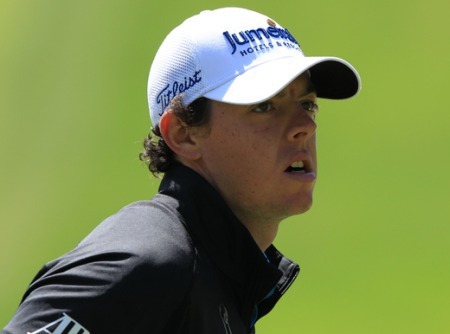 Rory McIlroy misses his birdie putt on the 18th in the second round of the US Open. Photo Eoin Clarke/www.golffile.ieRory McIlroy insisted he has been humbled by his recent run of form after a three-putt bogey on his final hole ended his US Open defence and condemned him to a fourth missed cut from his last five starts.